Meet Isabella, a 9 month old (approximate) precious female. Izzy had a rough life until 6 days ago when the Eberle family was made aware of her plight. Thanks to Jessica and her family, Isabella now has a chance at a charmed future. The Eberle family found out about Isabella through a friend and without hesitation took her into their home and immediately contacted GEBR. 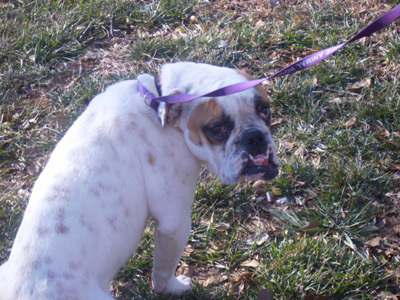 It was obvious that this sweet girl needed medical attention and they couldn’t leave her there. This family made it their priority to get her the help she needed. GEBR received an e-mail from the family and within 4 hours, with the help of Mrs. Eberle, Izzy was at Riverside Animal Hospital. Isabella is very thin and was loaded with worms. She also has Cherry Eye in both eyes and an old injury of her left mouth, making her lip droop on that side. The worms have been eradicated, she will soon start putting on weight. She has been brought UTD on vaccines. 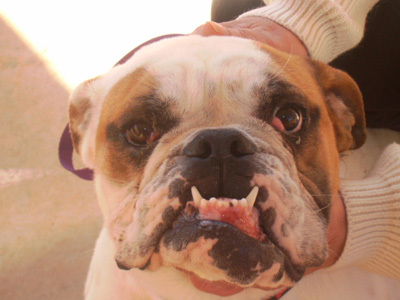 She will also undergo spay, cherry eye repair and we will attempt a procedure to correct the drooping lip. We hope the “plastic surgery” will correct what appears to be a purely cosmetic abnormality. There is no obvious wound or signs of infection in the mouth and the drooping lip doesn’t seem to bother her at all. Her behavior is perfect. She seems to go with the flow and isn’t bothered by other dogs. Any person or friendly dog who pays attention to her is her new BFF. The Eberle’s have several children and reported that Izzy was gentle with all of them. Isabella is crate trained (probably where she’s spent most of her life) and potty trained for the most part. She goes #1 outside, but waits to get back in her pen for #2. This may be a result of living in a crate most of her life; we’ll have to get her healthy and in a loving foster home to correct this problem. She doesn’t attempt this when she’s out and about in the vet clinic, just when she’s put back in her pen. 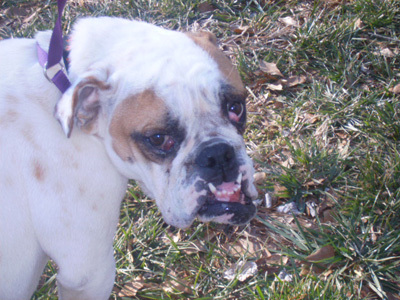 After a delay in treatment because of a Urinary Tract Infection, Isabella was spayed, had cherry eye repair and had her droopy mouth worked on. After a few more days of observation at the vet hospital, she will be released to foster care. This is a very very sweet girl with tons of personality. She’s had a pretty rough start in life and we are committed to making the rest of her life “charmed”. Update: Precious Izzy went to the bullie meet up this weekend. Her cherry eye is back in the left eye, will correct that again soon. She is gaining muscle mass and looks very healthy. She ran, played and had a blast with all the other bulldogs. Her lip deformity doesn’t appear as obvious since she is getting “thicker”. Her potty training has it’s ups and downs but she’s getting better. With good nutrition, she looks so much more healthy and her fur is absolutely beautiful. September 7, 2018: Isabella crossed over the Rainbow Bridge today. Please keep his family in your thoughts.